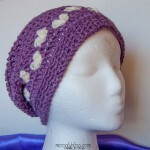 Last year I shared my pattern for the All Mine Crochet Slouch Hat, sized for adults. So this year, it’s time to add the baby, toddler, and child sizes! 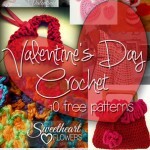 And since they’re little, there’s still time to whip one up for Valentine’s Day – or any day! Sizes: Baby (14 – 16″ head, 6.5″ tall) Toddler (16 – 18″ head, 8″ tall); Child (18 – 20″ head, 8.5″ tall) – be sure to scroll down to the size you want! Shell pattern: [Hdc, dc, hdc, ch 1, hdc, dc, hdc] in one st as directed. To make the seam less noticeable, you can use the Chainless Starting Double Crochet in place of the ch 2 and first dc of any row, if desired. Note that the non working yarn is held behind the stitch, as in tapestry crochet (see the link above for more info). Round 5: Ch 2. *Dc in next st. Skip first half of shell and work 3 dc in ch 1 sp. Skip second half of shell, then dc in next st, finishing with Color B. Skip next st, make shell, finishing last st with Color A. Skip next st. Repeat from * to end. Join with sl st to first st. (5 shells made) Break Color B. 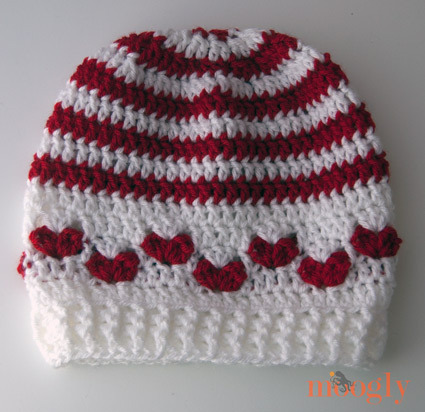 OPTIONAL: If desired, leave a long tail and at the end of the pattern, rather than just weaving this end in, you may go through and use it to tighten up the bottom points of the hearts, weaving it along the back as you go. Round 13: Ch 1, sc2tog over first 2 sts. *Sc2tog over next 2 sts, repeat from * to end, join with sl st to first st. (5 sc) Break yarn leaving a long tail. Weave tail through last row of sts and tighten to close hole. Weave in ends. Round 6: Ch 2. *Dc in next st. Skip first half of shell and work 3 dc in ch 1 sp. Skip second half of shell, then dc in next st, finishing with Color B. Skip next st, make shell, finishing last st with Color A. Skip next st. Repeat from * to end. Join with sl st to first st. (6 shells made) Break Color B. OPTIONAL: If desired, leave a long tail and at the end of the pattern, rather than just weaving this end in, you may go through and use it to tighten up the bottom points of the hearts, weaving it along the back as you go. Round 16: Ch 1, sc2tog over first 2 sts. *Sc2tog over next 2 sts, repeat from * to end, join with sl st to first st. (6 sc) Break yarn leaving a long tail. Weave tail through last row of sts and tighten to close hole. Weave in ends. Round 6: Ch 2. *Dc in next st. Skip first half of shell and work 3 dc in ch 1 sp. Skip second half of shell, then dc in next st, finishing with Color B. Skip next st, make shell, finishing last st with Color A. Skip next st. Repeat from * to end. Join with sl st to first st. (7 shells made) Break Color B. OPTIONAL: If desired, leave a long tail and at the end of the pattern, rather than just weaving this end in, you may go through and use it to tighten up the bottom points of the hearts, weaving it along the back as you go. Round 17: Ch 1, sc2tog over first 2 sts. *Sc2tog over next 2 sts, repeat from * to end, join with sl st to first st. (7 sc) Break yarn leaving a long tail. Weave tail through last row of sts and tighten to close hole. Weave in ends. All done! 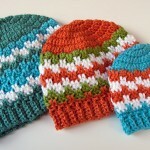 Hope you enjoy the Baby Mine (and Toddler and Child) versions of the All Mine Slouch Hat! And have a wonderful love-filled weekend! Super cute kid. 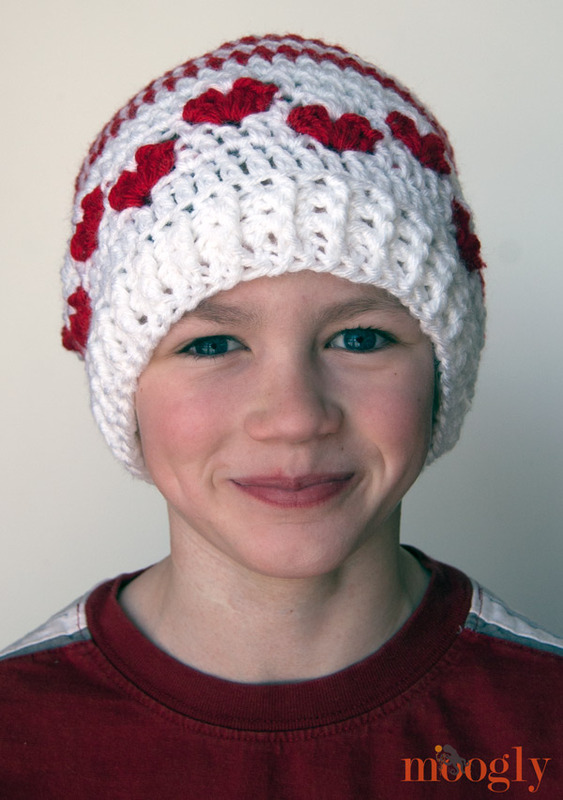 God bless him… a mama’s love all over that hat! You always provide such a lift and inspiration. 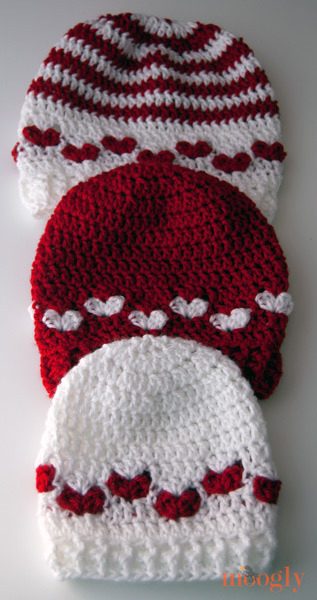 I am making mittens and hats for charities right now for toddlers, child, and teen sizes. I prefer working in a spiral from fingertips down to cuff, but a size chart would help no matter what the construction. Do you have a size chart that gives inches from the fingertips to thumb opening and from thumb bottom to cuff? I am never sure how many rows to make that will accommadate and be relative to the circumference. I don’t want to make dozens of items that cannot be used. Hi Maureen! Unfortunately Yarn Standards doesn’t have hand measurements. In these cases, I find it’s usually best to borrow a sizing chart from a manufacturer, and use that as a rough guide. 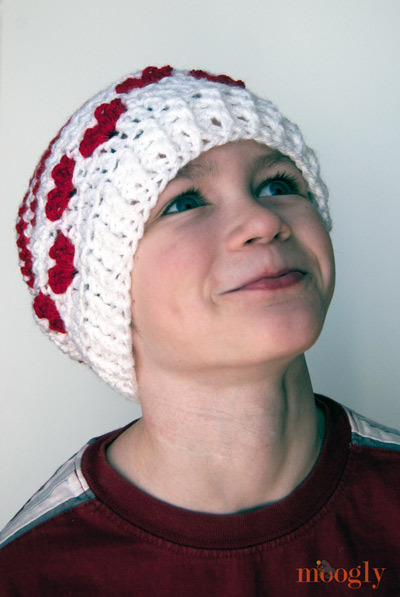 This one seems like a good option: http://www.greencupboards.com/media/catalog/product/image/guava-kids/sizing-chart.jpg 🙂 Thank you for what you do! 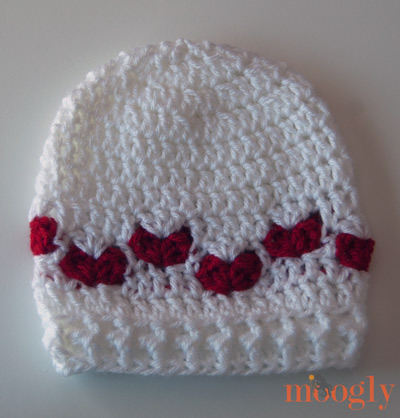 do you have the tutorial of to crochet the hat? here in NY is very very cold! I would like to crochet the hat for our newly granddaughter. This one just has the written pattern. Very cute! Loved it! Very clear and concise pattern. 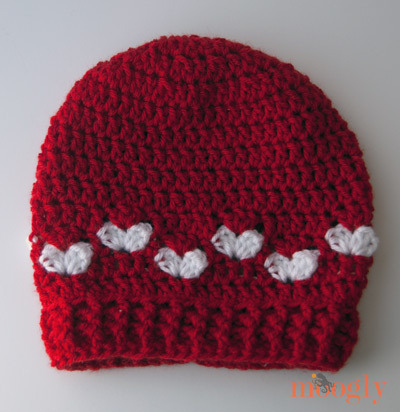 Mine doesn’t have as much slouch but my gauge per row was off! Thanks for the free pattern! Just made this for my daughter. Can’t wait to try it on her in the morning!! I’ll post a pic, thanks. I seem to be having trouble. I made the child size and it seems very long, also my hearts arent as clean looking as yours. Do you have any pictures to show where those stitches on either side are supposed to go? Did you get gauge? The optional instructions at the end of Rnd 6 make a big difference! The photo above the child instructions is the best picture I have. Is it possible to work it top down? I’m terrible at bottom up 🙂 also how do you make this one for an adult? I like this pattern better. I’m so glad you like it! You are welcome to share the link wherever you like! 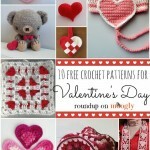 A tutorial on this pattern would be a great help. I just cant follow patterns. Nice pattern.im planning to make this pattern for a donation camp we r running.Only 4ply cotton yarn wil suit our purpose .R there changes that I can make in the pattern for this yarn substitution. Hello Jaggu! That is so much thinner, it’s not a straightforward change. You would need to make a gauge swatch and convert the math. Hi Virginia! What size are you trying to make? Thanks for replying but I figured out what I was doing wrong finally. I finished the hat and it looks very good. Again thanks.